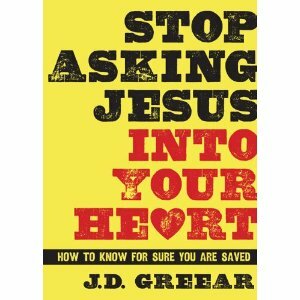 In his newest book, Stop Asking Jesus Into Your Heart: How to Know for Sure You Are Saved, J.D. Greear has written a book on a topic that inevitably all of us within the church have struggled with at some point, whether or not we can have assurance of salvation. The book really comes out of Greear's own struggle with his own assurance as a young Christian, one that would last for years. Although most probably have not struggled with this question on the level of Greear, "asking Jesus into my heart 5,000 times by 18, being saved in every denomination, and being baptized four times," we all at some point in our Christian walk struggle with our assurance. The purpose of the book is clear from the beginning by looking at the question, how can anyone know, beyond all doubts, that they're saved? To be fair to Greear, his own struggle came from looking at passages like Matthew 7:21-23, which mentions many people thinking that they know Jesus, but awakening on the final day to the reality that He never knew them. Chapter one looks briefly at both those who struggle with the assurance of their salvation and then those that are falsely assured by living however they want to because they are holding on to some meaningless prayer prayed at some point. To the second group, Greear says, "Salvation does indeed happen in a moment, and once you are saved you are always saved. The mark, however, of someone who is saved is that they maintain their confession of faith until the end of their lives." For many of us that grew up in the church such as myself, we will easily resonate with this book, especially those of us that prayed a generic sinner's prayer by asking Jesus into our heart. The book puts it this way, "'Praying the sinners prayer' has become something like a Protestant ritual we have people go through to gain entry into heaven. "To be clear, Greear does believe as ministers of the gospel that we should urge our hearers for a response, in fact he personally believes that if we do not then we have not fully preached the gospel. For some the first part of the title is a bit controversial, especially in the SBC in recent days, but that is not Greear's heartfelt desire behind the title or the book. His point is that salvation comes not because you prayed a prayer correctly, but because you have leaned the hopes of your soul on the finished work of Christ. Greear says with certainty that God wants us to have certainty about salvation, and believes that ones spiritual life really never takes off until assurance of salvation is present. In order to unpack that statement he shows how until one has assurance they will inevitably deal with all types of struggles including sin because of the doubt of their salvation. This small book is packed full of Scripture but specifically 1 John is looked at in regards to having assurance in salvation. In 1 John 5:-10-12, Greear shows how John identifies two components of assurance: Belief in a testimony about eternal life and; Evidences of eternal life at work in us. In Greear's own struggle, what eventually helped him have assurance of salvation was by looking at John 3:36 and realizing that there are only two postures we can take toward Christ: We either "believe" or we do not. And so in belief one does not have to hope they are forgiven, but rather one can know they are forgiven because as Greear's church summarizes the gospel: It is Jesus in my place. The apostle Paul also summarizes the gospel in a simple and straightforward way by saying to be saved you must "believe." Greear expounds on this statement by showing that biblical belief or faith includes volitional aspects. "Biblically speaking, repentance and belief are part of the same whole." "Conversion is not completing a ritual, it is commencing a relationship." Greear shows how that salvation was obtained by resting on two "facts" promised by God: He was crucified as the payment for our sins; He was resurrected as proof that God accepted His sacrifice as payment. To those continuing to wrestle with their assurance of salvation: "Don't try to find assurance from a prayer you prayed in the past; find assurance by resting in the present on what Jesus did in the past." Since belief and repentance are part of the same whole, repentance is not subsequent to belief; it is part of belief. Greear says it this way, "It is belief in action - choices that flow out of conviction." In this section Greear wants to be clear on repentance so he outlines what repentance is and what is not. Many reading this book will wonder if "once saved always saved," then why does the Bible warn about one losing their salvation? Clearly what the Bible teaches is that those who endure to the end will be saved, but how does that assure one of their salvation? Greear shows us in a biblically faithful way how a true believer can never be lost, but a true believer will also never stop following Jesus. Greear describes it like this, "Faith that fades, no matter how luscious its first-fruits, is not saving faith. Greear then points back to the title by saying, "Praying a prayer to ask Jesus into your heart, even if it's followed by a flurry of emotion and religious fervor, is no proof that you are saved." To be clear, Greear is not advocating that once saved someone will not struggle with sin. In fact, he believes that believers can and do struggle with almost every type of sin, but the key is how one gets up from sin. We must get up in constant posture of repentance and faith. Included in the book are two very helpful appendix sections. The first on the issue of baptism, especially for those that were baptized before they were assured of their salvation. The second on the indispensable link between assurance and the doctrine of justification by faith alone. I find this book to be a very necessary one and believe that this book is extremely helpful for everyone within the church. This small book will help both those that wrestle with their assurance of salvation and those that are overly assured to be able to know for sure they are saved. So if you have ever wrestled with the assurance of salvation than this is the book for you as it is made readable for all audiences. After reading this book, I highly recommend it as Greear has a pastoral heart to help people be assured of their salvation. Stop Asking Jesus Into Your Heart is the most concise book available on the assurance of salvation and one that I think will become a helpful discipleship tool for churches across America. You may even want to buy an extra copy as I have a feeling this will be the book to point people to on assurance for years to come.